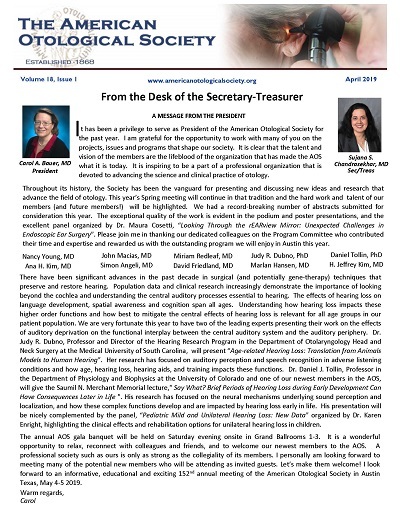 The American Otological Society - Celebrating 150 Years! The American Otological Society has a rich and relatively well documented history which goes back a century and a half. The inaugural meeting was held in the Ocean House, Newport Rhode Island, on July 22, 1868 when 9 members of the American Ophthalmological Society (founded 1864) met to organize a society focused upon "aural" medicine. Founding Members of the American Otological Society. The first elected president of the AOS was Dr. E. Williams. Annual Meetings: Since its inception the society has met annually, except for three years. The meeting was cancelled in 1877 due to lack of a quorum (railroad strike). No meetings were held in 1943 and 1945 due to war time transportation difficulties. Between 1885 and 1902 the Society met 13 times in New London, Conn. The Society met in Canada six times: 1915 (Niagra Falls), 1926 (Montreal), Toronto (1935, 1952), and Montebello, Quebec (1956, 1967). The first west meeting was held in San Francisco in 1950. The Society has met off of the North American Continent only twice: San Juan , Puerto Rico in 1966 and Wiakoloa, Hawaii in 1991. Membership: During the first century of the society, the active membership remained around 100, reaching a peak of 119 members in 1944. In recent years a modest growth has taken place and by 1992 there were 135 active members.In our 150th year, we have nearly 300 members. "The Award of Merit" and "Guest of Honor"
The American Otological Society is always looking to increase our membership with highly qualified individuals. In addition to our Active members, the AOS hosts a number of Associate and Corresponding members. 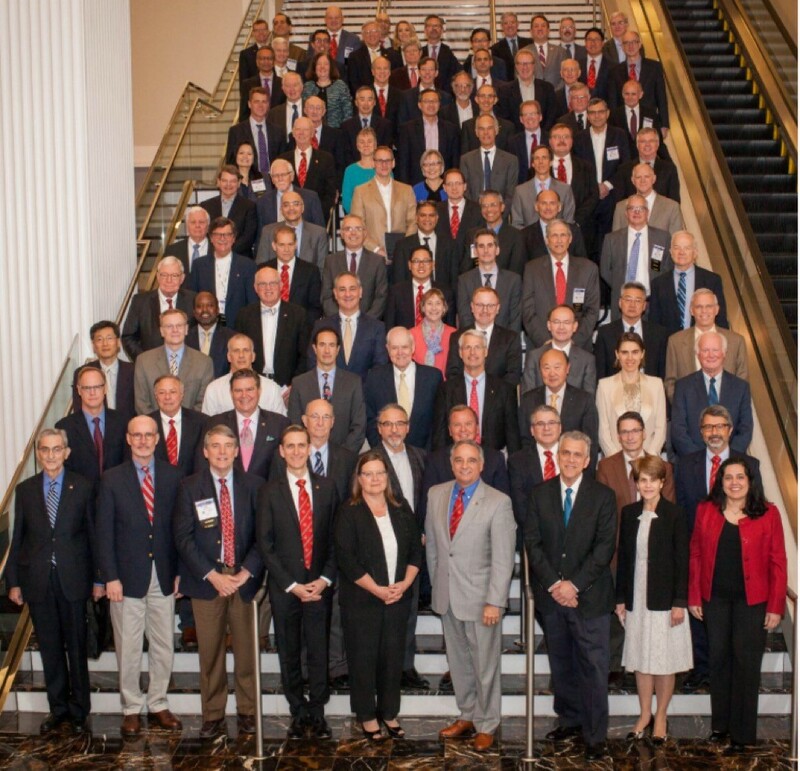 Associate members are individuals, including audiologists or PhD’s, who have overlapping interests in the AOS. As an example, we recently inducted a superb auditory research scientist. Corresponding members include those who would meet AOS membership criteria but are from outside the USA or Canada. Guidelines for each category of membership can be found in the AOS bylaws and guidelines for proposers of Active members may be found here. If you feel you know someone who would be a good candidate for any of these membership category, please feel free to forward their name(s) to the AOS Administrator, Kristen Bordignon. Applications and all supporting documents are due September 1st. Successful Candidates will be notified in December, induction will take place the following Spring. 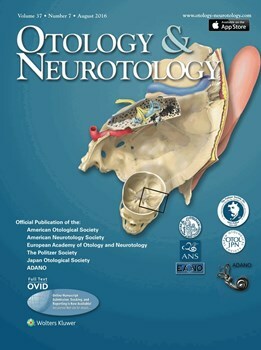 Otolology & Neurotology, the official Journal of the American Otological Society and the American Neurotology Society publishes original articles relating to both clinical and basic science aspects of otology, neurotology, and cranial base surgery. As the foremost journal in its field, it has become the favored place for publishing the best of new science relating to the human ear and its diseases. The broadly international character of its contributing authors, editorial board, and readership provides the Journal its decidedly global perspective.